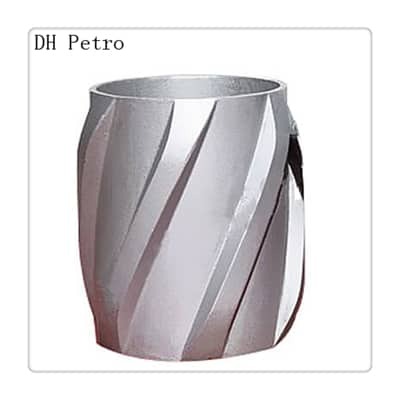 1.Aluminium Spiral Solid Centralizers are developed in response to the need for better cementing in high deviated and horizontal well. 2.These are designed to provide optimum flow and its fins or blades overlap the entire 360-degree open hole circumference. 3.herefore its reduced flow area between the spiral provides and creates vortex motion to increase fluid velocity with direction. 4.Even without rotation, the relived angle fins/ blades induce turbulent flow for improved cutting and filter cake removal. 5.The angle of the uniquely designed spiral fin produced maximum fluid swirl, thus maximum removal of debris around the casing in any type of hole. 6.These Centralizers withstand high well bore temperature while providing maximum horizontal standoff. 7.All centralizers are stored painted or coated with polyester powder. 8.These are available in all sizes ranging from 4 1/2″ to 20″. 9.Any special sizes can be made available on request.